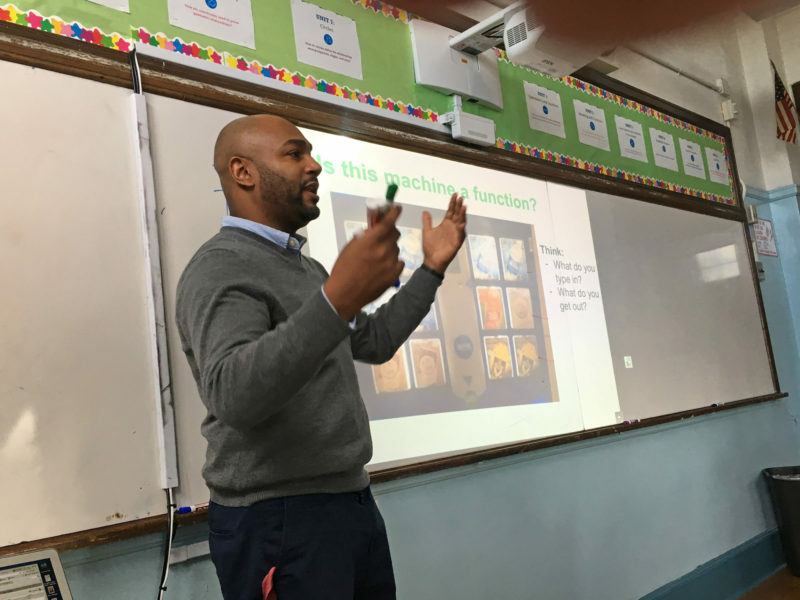 NEW YORK — Michael Gallin, a 34-year-old math teacher at KAPPA International High School in the Bronx, was winding his way through the cluttered aisles of his algebra classroom listening for sighs of frustration. When a student in faded jeans and a sweatshirt shouted, “Oh my God. I’m so pathetic,” after misinterpreting a graph, Gallin responded, “Who’s pathetic?” as if offended by her cruel self-assessment. A moment later, when that same student had a eureka moment, he urged her to explain how she’d discovered the answer to her seatmate. “Don’t be nervous,” he said. Gallin continued encouraging, cajoling and coaxing his students — some of whom have failed the New York State Algebra Regents Examination four times — for another 15 minutes, until the period ended. American students are bombing math. In 2015, a mere 25 percent of high school seniors were proficient in the subject, according to the National Center for Education Statistics, which produces the most reliable data on academic competency. Efforts to improve these numbers have abounded. Dozens of states have incorporated more rigorous standards through the implementation of the Common Core. Many schools have tweaked math classes to include more visualization and lessons that relate more to real life. But Gallin is part of a growing band of educators who believe that to help struggling students get ahead, teachers must also attack the emotional barriers that are holding them back. Repeated failures, they say, can be deeply scarring. Negative feelings spiral into damaging self-talk that eventually paralyzes students. In the fall of 2016, increasingly frustrated by his inability to motivate his students despite his energetic teaching style and popularity inside the classroom, he was drawn to the idea that addressing emotional barriers might help them. At the time, The New York City Department of Education was developing a research division focused solely on student motivation. Working with Eskolta School Research and Design, a New York-based education-consulting firm, and the Carnegie Foundation for the Advancement of Teaching, a California-based education research center, the Department was testing solutions inside dozens of schools. Gallin’s school was one of them. Gallin approached Alicia Wolcott, the Eskolta advisor working at his school, and told her he wanted to make some classroom changes too. They met several times inside the school’s resource room and mapped out a plan, sometimes soliciting advice from other teachers. Wolcott encouraged Gallin to carefully study his students’ work and look for clues. That’s when he noticed a curious trend. In homework assignments, classwork and practice tests, his students didn’t actually get hard problems wrong; they didn’t even attempt them. Wolcott considered this information progress. “Then the question became: ‘What’s going on inside students’ heads and what do we do about that?’” she said. During the winter of 2017, after multiple meetings, including one with the renowned mindset researcher Chris Hulleman, a professor at the University of Virginia and the director of The Motivate Lab there, Gallin began to test a run of tweaks. He started by gently encouraging students not to leave any classroom worksheet problems, especially the hardest ones, blank. But that didn’t really work. The message seemed to be getting through. He hoped that once his students stopped avoiding the problems that made them uncomfortable, they would be more open to absorbing the math skills they needed to get them right. When students did a problem, he urged them to read it multiple times: once for context, once for the actual question being asked and once to determine what information was being given. He encouraged them to visualize the problem, to test a variety of different strategies for solving it and to practice talking about their strategies and hearing the strategies used by other students. The small tweaks paid off. After the June 2017 Regents, 25 of the 41 students who had repeatedly failed the state exam passed — a rate of 61 percent. Another 12 students came within a few points of passing. In 2016, a mere 37 percent of the school’s test-takers passed. The approach Gallin took is not unique to his Bronx classroom. 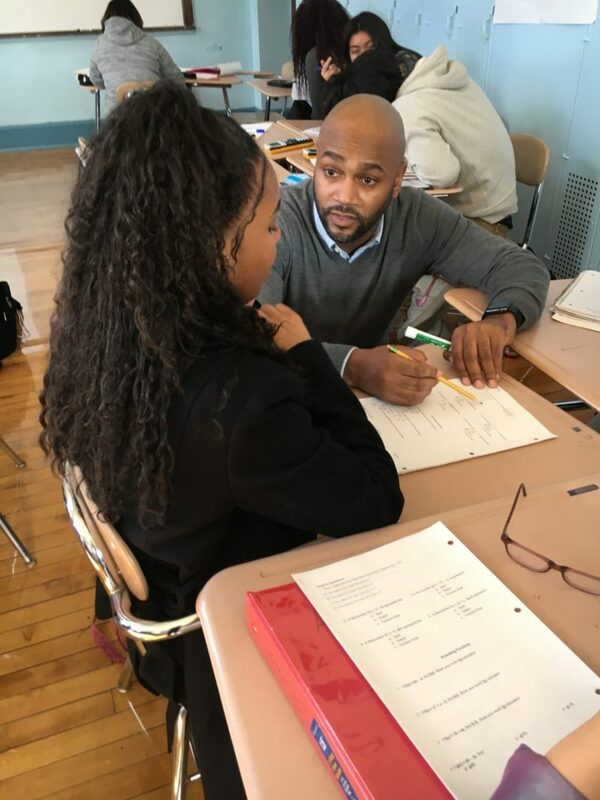 With the help of the Carnegie Foundation for the Advancement of Teaching, hundreds of teachers around the country are testing their own ways to re-energize students plagued by past failures, by merging specific emotional skills with academic ones. The foundation has done seminal work designing two highly successful math programs for community college students struggling to develop both necessary math skills and a more positive outlook about themselves as math learners. Over the past five years, the foundation has begun to address K-12 classrooms, bringing together university researchers, education consultants and hundreds of teachers like Gallin. During national conferences, workshops and school-wide meetings these teachers share very specific and very real classroom challenges. A high school English teacher might talk about students who write so poorly, they are too dispirited to revise papers. A history teacher might ponder what to do about students who are so far behind, they stop studying altogether. Researchers who run motivation labs on university campuses around the country talk to the teachers about what the most up-to-date research reveals about the root causes of their students’ disinterest or avoidance. Together, the researchers and teachers come up with targeted solutions, which they then test inside real classrooms to see if they actually work. If the solutions help, teachers share them with each other. If they don’t, teachers and researchers work together to alter and retest them. It’s not always easy to tell whether the new approaches help overall student performance, because schools interested in this type of experimentation are often innovating in other ways as well: changing grading policies, moving to more project-based learning models and rethinking discipline strategies. But as more teachers have signed on to the Carnegie program at KAPPA International, attendance and four-year-graduation rates have gone up. In 2014, 83 percent of the school’s students graduated within four years; last year, 91 percent did. The school’s overall average Algebra Regents exam score went from 60 in 2015 to 67 last year. The required passing rate for most students is 65. Teachers working with the Carnegie Foundation in other schools around the country have reported similar gains. At Thomas Harrison Middle School in Harrisonburg, Virginia, eighth-grade civics teachers saw significant gains in student performance when they altered the type of feedback they gave struggling students. Hulleman and Kenn E. Barron, a researcher at the Motivation and Social Identity Lab at nearby James Madison University, helped them brainstorm some of the new strategies. Today, when students take a practice test and fail, they don’t just get a score: They are told exactly how many more problems they need to get right to pass. Then, if they agree to follow a step-by-step study roadmap, with guidance from their teachers, they are given the opportunity to take a retest. Last year, 25 of the 36 eighth-graders who were struggling in civics took advantage of the new system for one unit. When they were retested on the unit, the students saw their scores rise an average of 25 percent. The classroom practice also embraces a quality-control process made famous in the 1950’s by management consultant W. Edwards Deming, who advised business leaders to mimic the scientific method when making changes to procedures on plant floors and inside offices. First, he told them, plan a small change, do it, see if it works, and only then employ it on a large scale. But even fierce advocates say this incremental process has its limitations. It requires time, commitment and the help of someone like Hulleman, a renowned researcher who travels around the world talking about student motivation. And, perhaps more importantly, even a method that works can be quickly derailed by changes in school staffing. In 2015, after three years of intensive work, North Queens Community High School recorded impressive gains in the number of students passing math. The school-wide passing rate for the algebra exam rose from 31 percent of students in June 2014 to 70 percent in June 2015. But a year later, administrators put the program on hold because of staffing shifts. To avoid a similar fate, advocates encourage schools to appoint a school leader to be in charge of the work. The students in Gallin’s class are far from the centers of education research. And most haven’t discovered a new passion for numbers this year. But for some students, Gallin’s approach has altered what they tell themselves when faced with their least-favorite subject. This article led me to believe that another student had a clever idea on solving the polynomial equation, other than simply plugging 2.7 into the x variable and grinding out the arithmetic. But none was included in the article. As a long ago math teacher, I could not find any factoring of this 3rd degree equation which would simplify solving especially with the decimal constants. I wish the article had explained the better idea.